When I first started with IOS development, I used SQLite as the main database engine for my first iPhone application, AutoXLogger. I recently started looking at the effort involved to revive this project and update it for IOS 7.0 and beyond. 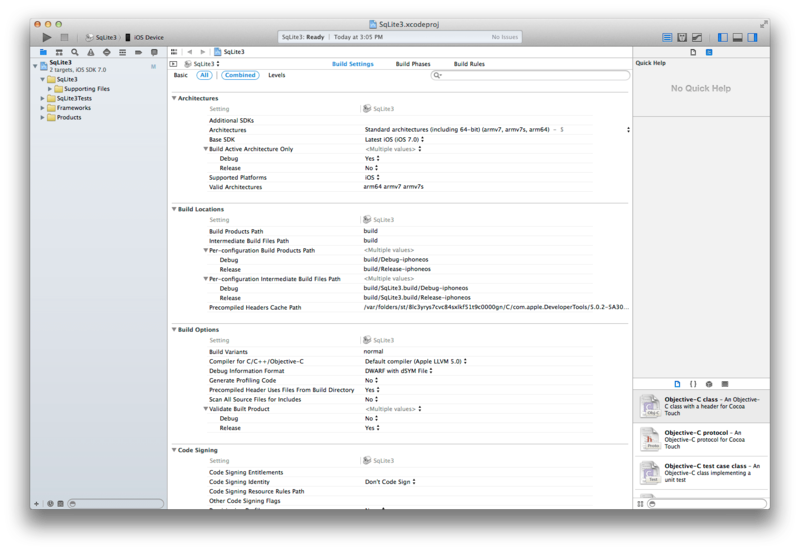 The version of SQLite that ships with Xcode is quite old and it lacks many of the newer features found in new builds. To get around this problem I created a static library that is built using the latest SQLite build. It is really not too hard of a project once you get the proper build settings configured. SQLite is very portable and it is not hard to build it on IOS. To build a static library that you can use in your IOS applications is an easy task. 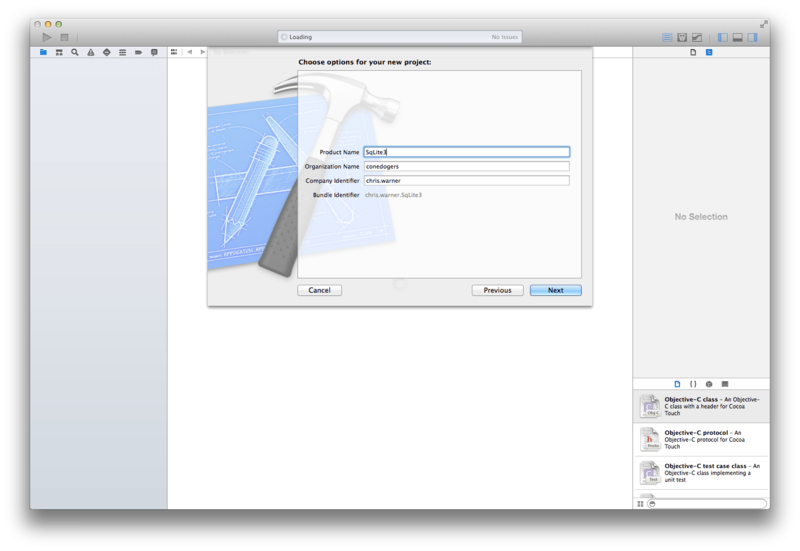 Using Xcode, create a new static library for IOS. Give the new project a name. 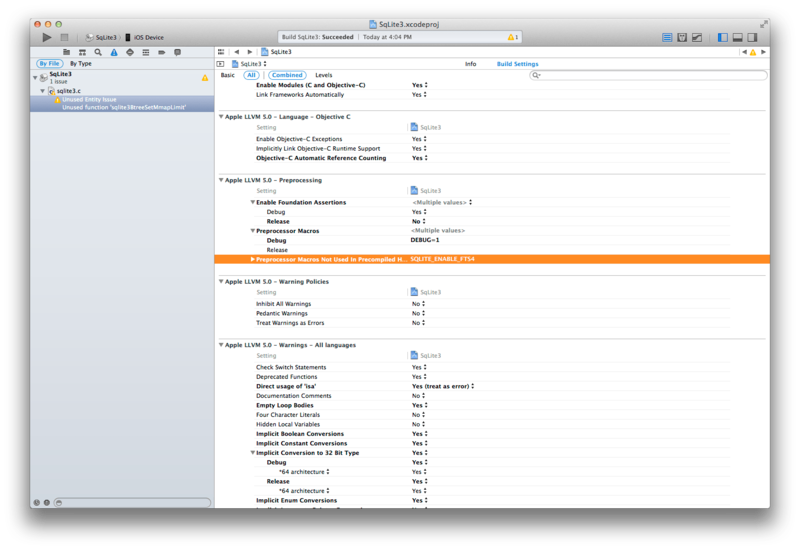 Delete the default Xcode generated files. We will not be using these files. Add the SQLite source files. SQLITE_DEFAULT_AUTOVACUUM=<0 or 1 or 2> Determine how the file size management and how free space is managed in the database file. default is off(0). See the documentation on the auto_vacuum flag for details on this feature. SQLITE_DEFAULT_CACHE_SIZE=<pages> This sets the default size of the page-cache for each attached database, in pages. This can be overridden by the PRAGMA cache_size command. The default value is 2000. SQLITE_SECURE_DELETE This causes deleted content to be written overwritten with zeros. SQLITE_THREADSAFE=<0 or 1 or 2> Configures the threading model used bySQLite. When compiled with SQLITE_THREADSAFE=0 all mutexing code is omitted and it is unsafe to use SQLite in a multithreaded program. When compiled with SQLITE_THREADSAFE=1 SQLite can be used in a multithreaded environment. This is the default. When compiled with SQLITE_THREADSAFE=2, SQLite can be used in a multithreaded program so long as no two threads attempt to use the same database connection (or any prepared statements derived from that database connection) at the same time. See the threading mode documentation for additional information on aspects of using SQLite in a multithreaded environment. SQLITE_ENABLE_FTS4 When enabled, the string searching capabilities of the database engine are significantly enhanced. This produces a performance gain when executing a query against the database, so enabling this feature is recommended. SQLITE_ENABLE_MEMORY_MANAGEMENT This option allows SQLite to release unused memory upon request. SQLITE_DEBUG Turns on the debug asserts() used within SQLite. SQLITE_MEMDEBUG Turns on a debug memory allocator, similar to debug memory routines used in debug mode builds. 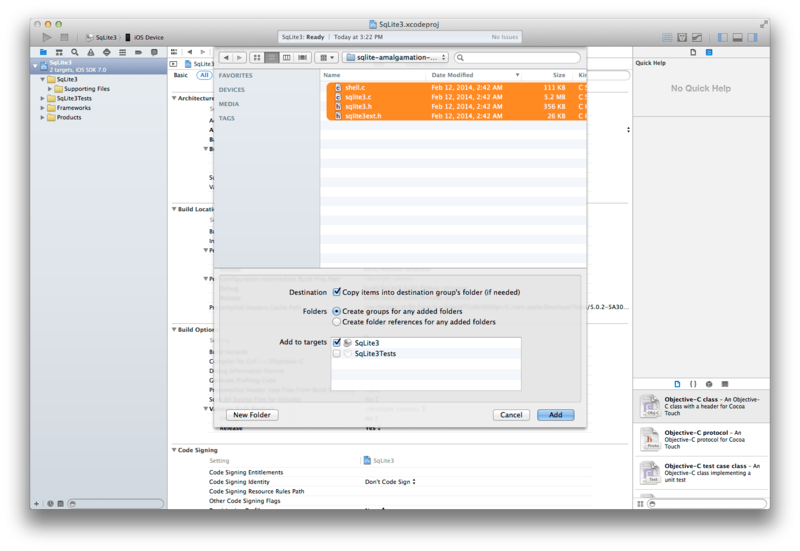 At this point you should have a static library building for your copy of SQLite ready to include in your Xcode project. Up next we will write a test app to drive your new SQLite library. In the mean time, if you want to try and build your own copy of this library, you can either download the SQLite source code yourself and follow these steps, or download the complete library project from my GitHub account.